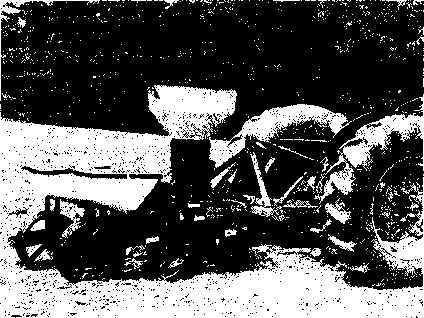 (b) in field operations: September 1971 The prototype dryer is still in use. The drying rate of cocoa beans has been compared with that in a common barcaja, the traditional sun drying platform located at 30 m from the glass roof dryer. 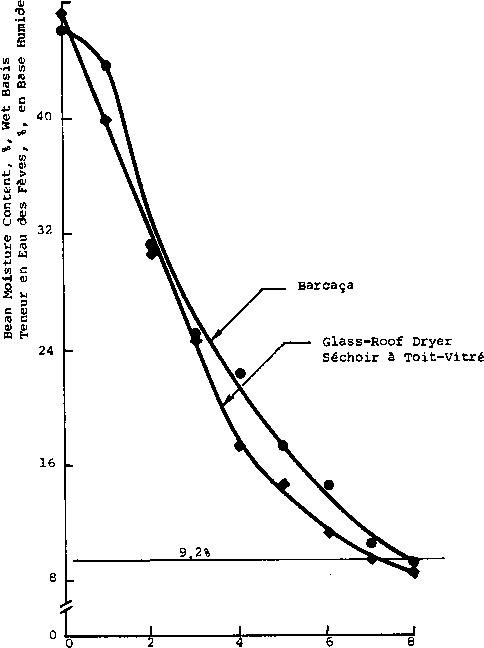 The end point of the drying period is reached in the glass roof dryer one day before that of the barcaga drying platform, that is 7 days instead of 8 days, (see figure 4) The tests showed a higher drying efficiency for the glass roof dryer over the common barcaja. When using solar energy, a layer of cocoa beans 3 to 4 cm thick, is spread on each platform at a time and,without any artificial heating, a drying period of 6 to 10 days is needed per batch, depending on weather conditions. The mean maximum temperature inside the dryer, at around mid-day is approximately 20°C to 25°C higher than ambient, while the minimum relative humidity at the same time of day inside the dryer is around 15 to 20% lower than the ambient. When gas is used for artificial heating the maximum drying temperature is maintained at around 70° to 75°C in the initial stages and is gradually lowered as the moisture content is reduced to around 15 to 20%. General cleaning and maintenance cost per year is approximately $100,00 U.S.
For only solar drying of cocoa beans, the estimated cost in labour is less than 3 cents per Kg of cocoa (dry). There are no limiting factors for the extension of the use of the dryer; however, an economic evaluation of the system is being carried out at present by CEPEC before generally recommending it to the farmers. The use of glass panels, 1 x 1 m, for the construction of the roof necessitates careful handling during the construction. The glass roof dryer has been specially designed and developed to meet the drying requirements of cocoa beans; however, it is also versatile in design and can be easily adapted for use with other crops. For solar drying, no structural alterations are considered necessary, while for artificial drying by gas, it would be necessary to carry out preliminary experiments to determine the range of drying temperatures suitable for each crop. Proceedings of the International Congress, "The Sun in the Service of Mankind", Paris, July 1973, 17 pp.